We invite you to explore India - the Land with infinite beauty ! Whether you soar high into Himalayas or peer under the ruins of the Ancient monuments dotting the landscape of India, you will cherish the experience long after your visit ! This India Travel Guide on St. Mary's Basilica Bangalore is free from any commercial interest! This site is dedicated to promote India - the vast subcontinent, its glorious past, magnificent landscape and its infinite variety. One of the oldest churches of Bangalore, St.Mary's is the only church in Karnataka to be elevated to the level of a basilica. Farmer settlers from Ginjee, in present Tamilnadu built a thatched hut in the 17th century to practice their religion. They named it the 'Chapel of Kanikkai Madha' - which meant 'Chapel of Offering to Mother Mary' in Tamil. These agricultural settlers had migrated from the neighboring Tamil speaking region. Europeans and Indians settled here during the 17th century attended mass here. When Fr. Jean Dubois, a French Jesuit priest came with the English soldiers in the year 1799, he used this makeshift Chapel for conducting the mass. This small chapel was finally built with brick and mortar in 1811. Rev. Fr. Andreas, an Indian priest expanded the church building in the shape of a cross. The hall was built in the east-west direction and with two aisles north and south. The church was pulled down in 1832 due to communal riots. Everything was destroyed save for the small statue of Mary. Legend has it that when people tried to destroy it, they lost their eyesight. A few years later, a great plague had spread through out Blackpalli (as the place was known then) and people sought the intervention of Mother Mary to relieve them. Since she cured the people from the dreadful disease and bestowed them with good health, she was also called as 'Annai Arokiamarie' (Our Lady of Good Health). You will find the statue of Our Lady placed near the main entrance. It is believed that when the new church was built in the year 1875, people tried to relocate this statue on a prominent altar inside the Church, but they were unable to move the statue. In the year 1974 this church was officially declared as a Basilica. It is the sixth Basilica of India. 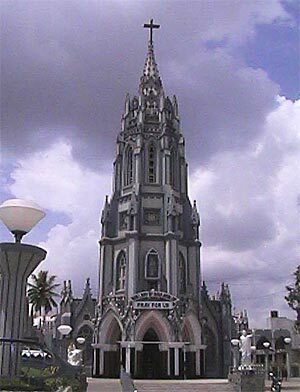 St. Mary's Basilica is situated opposite the Russel Market Square in Shivajinagar, Bangalore. The present day Church was built by Father Kleiner in the year 1875. St. Mary's Basilica is a spacious gothic Church - designed by a French architect in the shape of a Cross. The magnificent and splendid vaulted tower forms the frontage of the Church - 160 feet high. A beautiful statue of Mother Mary holding child Jesus in her arms stands 6 feet tall to bless all her devotees. The statue of Mother Mary is draped in a sari. In 1882, St. Mary's Basilica Church, was further adorned with stained glass windows brought from Paris. They had to be removed during the World War II, and were later replaced with utmost care in the year 1947.When the Church was elevated to a Basilica in 1973, by Holy Father Pope Paul VI, the church retained its earlier title of "Annai Arockiamarie Basilica" - Mother of Good Health Basilica. St. Mary's feast held every year attracts thousands. During September each year, the feast of Mother Mary is held here and festivities go on for nearly 10 days. Novena is held on the first 9 days. During the days of the feast, the statue of Our Lady is placed in a palanquin and taken in a procession. You can hear the strains of the Ave Maria being sung in praise of Our Mother.